Today the NY Times is reporting that the stolen laptop and hard drive containing data on an estimated 26.5 million veterans and military personnel has been recovered. According to the report the FBI's preliminary review found no evidence that anyone accessed the data. For more information about the release of data and the class action filed as a result of the release check out my previous post on the topic. What impact will the recovery of the data, allegedly not accessed or used improperly by the parties who stole the data, have on the pending class action litigation? But . . . at the same time the House of Representatives Veterans Affairs Committee has learned of a May 5 incident in which a data tape disappeared from a VA facility in Indianapolis, Indiana, and a 2005 incident in which a VA laptop was stored in the trunk of a car that was stolen in Minneapolis. Today I noticed that the Huntington Herald Dispatch has added a number of blogs -- from the Thundering Herd to Marshall Movie News to Hot Topics to Twentysomethings in Huntington to Tech Gadgets and Gizmos, etc. I like the style and format for the blog which are based on a Blogger platform. Based on the archives it appears that these have been live since March 2006. Also, it's great to see the Herald Dispatch taking the technology lead by adding headline RSS feeds and RSS feeds for all its blogs. As a strong supporter of RSS technology By adding the RSS feed feature the Herald Dispatch has become "The [Online] State Newspaper". I've added the feeds to my RSS reader. Congrats to the Flaherty, Sensabaugh & Bonasso, PLLC YMCA Corporate Cup Team for its impressive win in the 2006 Kanawha Valley YMCA Corporate Cup. This makes 6 consective years that FS&B have taken the top spot in the competition. FS&B won 5 consecutive championships in Division I. Due to the growth of our firm, we were forced to move up to Division II and compete with companies that had up to 300 employees. The team took on the challenge and will now be looking toward a 7th win in 2007. Also, congrats go out to Arnett & Foster who took first place in Division I and the West Virginia Department of Environmental Protection for its first place win in Division III. Since I'm on a FestiVALL catfish kick -- what's a few more fish tales from Father's Day. I grew up with the beautiful Ohio River in the backyard and we visited Papa's house this past weekend for Fathers Day. We went fishing in the backyard and came away with fun, fish and some good photos. A shot of the fisherman watching his line at dusk on the great Ohio River. First bass from the Ohio River. Here's the fish that got away. This is the largest catfish that I've ever seen come from the river. The head was all that was left from this old fish washed up on the bank. I've heard stories of this size catfish living on the bottom near the Hannibal Dam -- but never proof. I suspect this one would have been at least 4 feet long. Yes, that's a dollar bill laying next to his mouth in the second photo -- his mouth was wider than the dollar bill. Relaxing with Papa after a long Fathers Day reading Richard Scarry's What Do People Do All Day. FestivALL has started in Charleston. Took a stroll late in the a.m. to get my haircut and saw the first signs of the Catfish being hung on Fife Street. Just noticed via Oncee that Scott Michell at Entropy has the first photos of the Kanawha River catch. I'm sure that Rick Lee will get some great shots. More Fish tales . . . Courtesy of Dale Morton's Costume Blog, one more fish tale. Happy 4th of July! Today's Charleston Daily Mail reported on the Performance Review Report issued by Public Works LLC, a consulting firm hired by the state to look at and identify specific areas of state government -- including health and human resources -- where cost savings could be generated.
. . . One example of a cost-cutting solution involves revamping the West Virginia Medicaid Fraud Control Unit within the Department of Health and Human Resources. Public Works suggests adding staff to the unit, which has only six investigators. Through combating Medicaid fraud further, the state could save $20 million in its first year of increased efforts, according to the findings. West Virginia's annual Medicaid budget is $2.3 billion, the largest expenditure item in the state. . .
What this means for health care providers in West Virginia is that there will be an increase in investigations and enforcement activities by the West Virginia Medicaid Fraud Control Unit. For more info on the report check out the Governor's Office press release (and audio), State Will Realize Savings of $318 Million By Implementing "Common Sense" Cost Saving Measures. HIPAA privacy watchers will find the following Texas decision, Greg Abbott, Attorney General of the State of Texas v. Texas Department of Mental Health and Mental Retardation, of interest. The opinion issued by Honorable Patrick Keel of theTexas Court of Appeals, Third District, upheld a 2004 opinion by Texas Attorney General Greg Abbott under Texas' public health reporting law. A reporter made a public information request to the Texas Department of Mental Health and Mental Retardation (the "Department")asking for statistical information regarding allegations of abuse and subsequent investigations of abuse in state facilities and for the names of the facilities in which the alleged incidents occurred. The Department believed that the information could not be released because it was protected health information prohibited from disclosure by the Health Insurance Portability and Accountability Act of 1996 ("HIPAA") and asked the Attorney General to provide an opinion as to whether the information could be released. See Pub. L. 104-191, 110 Stat. 1936 (HIPAA codified in various sections of 8, 22, 26, 29 and 42 U.S.C.A.). The Attorney General concluded that the information was subject to disclosure by the Public Information Act, which requires the disclosure of public information in response to public requests. Tex. Gov't Code Ann. §§ 552.001-.353 (West 2004 & Supp. 2005) (Public Information Act). The Department contested the Attorney General's opinion and filed suit in district court. The district court concluded the information was confidential and not subject to disclosure. The Attorney General appeals the decision of the district court. We will reverse the judgment of the district court. Don't miss this week's Blawg Review #61 over at Blonde Justice, in collaboration with Woman of the Law and Not Guilty. West Virginia Department of Health & Human Services, Bureau of Medical Services (West Virginia Medicaid) gets a mention in today's Washington Post, "States' Changes Reshape Medicaid," for taking the lead on implementing steps to transform the traditional role ofMedicaid. West Virginia's efforts focus on making the Medicaid recipient more responsible for their care and treatment and creating incentives for becoming healthier, including having preventative screenings, adherence to health improvement programs, not missing appointments and taking prescribed medications. Failure to follow the redesigned guidelines will make the Medicaid recipient eligible for less benefits. According to the article, many states are watching the West Virginia initiative starting July 1 to require Medicaid patients to sign a members agreement promising that they will keep appointments, take prescribed medications and focus more attention on preventative medicine for themselves and their family rather than overusing hospital emergency rooms. Following up on my 643 Blawgs and counting post, another article on law bloggers crossed my screen thanks to Evan Schaeffer at Legal Underground. Tom Mighell of Inter Alia and Between Lawyers has written an article over at ABA Law Practice Management titled, "The Next Stage of Lawyer Blogging." The article discusses the past, present and future of law blogs. By his calculation there have been over 1,500 law blogs created since 2002 and that 80% of these are still active. That would put the number at roughly 1,200 law blogs (1,200 - 643 = 557). The article provides some practical advice for lawyers who might be just jumping into the blogoshere and allows those of us who have been blogging for a while to better understand why we do it and how we can improve what we are doing. I've been toying with the idea of a collaborative health care blog idea and was excited to see that Tom predicts collaborative blogs will be on the rise in the future. by this moratorium. This moratorium shall continue until the development of State Health Plan Standards for evaluating CT services, or one hundred eighty days from the declaration of this moratorium, whichever is less. A short summary of the Order can be found in the May 26, 2006, edition of the WVHCA Newsletter. A complete copy of the Order can be obtained directly from the WVHCA. The West Virginia Health Care Authority has issued proposed revisions to the Hospice Service certificate of need standards. The current Hospice Service CON standards were approved by the Governor on June 21, 2001. Written coments on the proposed certificate of need standards may be submitted to Dayle Stepp, Director of Certificate of Need no later than June 23, 2006. 643 blawgs (or legal blogs) and counting. "Blawgs on a Roll" by Dahlia Lithwick with The American Lawyer provides a good perspective on why niche law blogs are growing and filling a needed gap in legal education and providing the public with legal information. Who better to write about the law than lawyers who specialize in that particular area. One area of my practice involves the regulatory world of health care certificate of need in West Virginia. I often notice that the media misses the mark when reporting on certificate of need issues. No disrespect to the legal reporters covering the CON Beat but as Ms. Lithwick points out its "difficult to write about the law in a way that is both technically accurate and also interesting and accessible to lay readers." Believe me, West Virginia certificate of need law can be downright boring at times -- but it impact on health care planning in West Virginia is important. This is especially true in a rural state like West Virginia where issues surrounding access and quality of health care are vitally important.
. . . And why are legal blogs already so much more nuanced, opinionated, and exciting than most other types of legal writing? I think it's because legal journalism has operated for so long along a fairly narrow bandwidth. Some legal writers have simply internalized the canonical rules of legal writing in general: Separate fact from opinion. Respect authority. Sedate is good, but boring is better. Other journalists have the opposing tendency, which is to skip over the so-called boring bits and shorthand technical details. Justice Kennedy is correct in pointing out that while editorial writers are quick to express opinions about the case law, they don't always take the time to explain how or why the courts arrived at their decisions. A results-oriented analysis of a case too often suggests that the justices took a results-oriented route to get there. . .
To be sure, legal bloggers are still working through their growing pains. Debate rages among them about whether law review articles are relevant anymore, whether blogging counts as real scholarship, whether junior faculty should avoid blogging until they gain tenure, why women tend to eschew legal blogs, what counts as a legal blog, and so on. I'm looking forward to the second edition of Charleston FestivALL set for June 23-25 in Charleston, West Virginia. Seeing a post about the Catfish of Fife Street over at Dale Morton's Costume Blog prompted me to check out the 2006 FestiVALL schedule. (Dale, can't wait to see the final catch.) You ask "What is FestivALL?" Be sure to check out the great line up featuring: The Neville Brothers; Blues Brews & BBQ; Wine & All That Jazz, featuring Chris Botti; Chris Botti; Moutain Stage, featuring: Bruce Hornsby, The Dirty Dozen Brass Band, Tommy Emmanuel and The Believers; FOOTMAD (Friends of Old Time Music and Dance); Robert Shafer; Bob Thompson Unit; Blues de Jour; The Carpenter Ants; The Soul Doctors; Robbie Mackey; WV Dance Company; and so much more! If you didn't attend any of the events last year don't forget to attend this year. For those of you who haven't been to Charleston or West Virginia this is a great time to visit and appreciate what we have to offer. For more info on FestivALL don't forget to check out the GAZZ FestiVALL Blog. 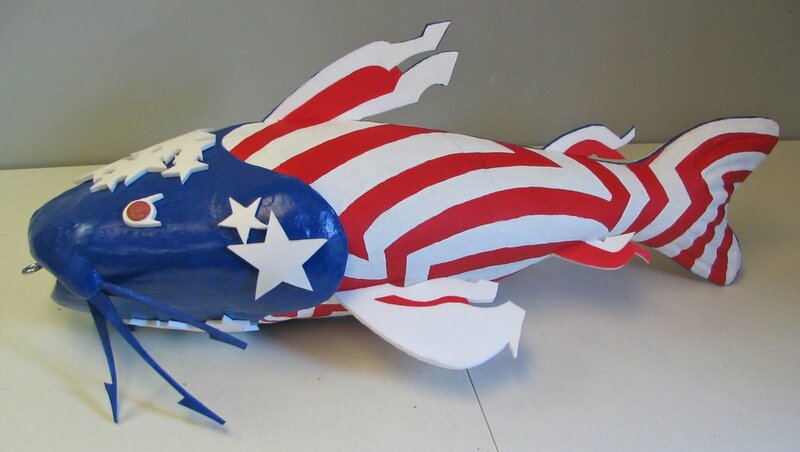 UPDATE: More fishy tales from today's Charleston Daily Mail about the clay and papier-mache catfish making an appearance at FestivALL courtesy of Dale Morton Studios.